Every business owner/leader I've met lately tells me that they know they should invest more time, energy, and money working on themselves and their business and yet they're not. "I know I should but I don't have time," they say. You? My friend and colleague Keith Abraham says "If you're not investing in yourself you're a poor judge of a great investment." You? You must make the time before it's too late. If your life or that of your family was threatened would you make the time? Well it is and they are! Folklore asks "What if I train them and they leave?" and answers "What if you don’t train them and they stay?" The same it is for you. Failure to invest time, energy, and money working on yourself and on your business is costing you dearly. Like everyone else you have 168 hours every week. It's your choice what you do with your time. Is it time literally for you to make different choices? If a picture is worth a thousand words, a process visual is worth a thousand pictures. Take a sheet of paper and write down what's remarkable, great, good and bad and ugly about your life and work. Share what you wrote down with people you trust and who will give you candid feedback. On another sheet of paper write down who you're still to become in your life and what you're still to achieve in your business. Share this too with people you trust and who will give you candid feedback and feedforward. On one side of a A4 sheet of paper summarise what is in a paragraph and what can be in the next 90 days in a paragraph. Describe in a sentence your strategy to move from what is to what can be. Describe in a sentence your gifts (talents) that you will need to enhance in order to move from what is to what can be. 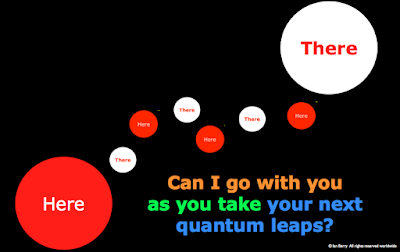 Outline 3 quantum leaps you'll take in the next 90 days to move from what is to what can be. 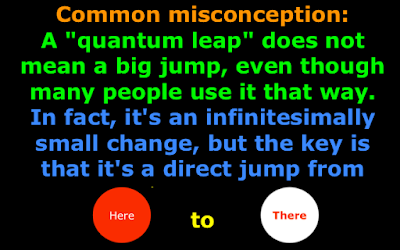 Remember quantum leaps are not big jumps rather small jumps from here to there. Share your plan with people you trust and who will give you candid feedback and feedforward. 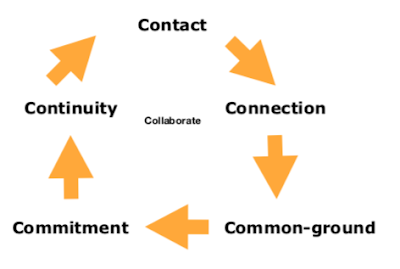 Get a commitment from them that they will engage in candid conversations with you every week to appreciate you when you take action and help you to be accountable when you don't. 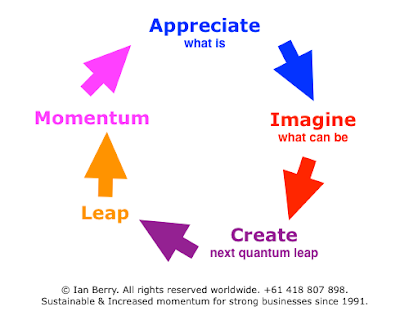 The above 4 actions will see you gain positive momentum and achieve what you want one quantum leap at a time. You'll soon have more time and energy as a consequence of doing the above. Repeat the 4 actions every 90 days. Help everyone else in your business to take these 4 actions. Soon you'll be in the habit of working on yourself and your business. And so will everyone else. You'll never look back. And everyone will be happier, more productive, and achieving better results. Contact me on +61 418 807 898 if you'd like a performance partner external to your business.